The EPS staff quickly cleaned their classes and put away any furniture before they all went home to have an hour or two to rest. Everyone was coming back to greet our special visitors at 6pm Friday night. Whaea Lesa tried to get photographs of our visitors from behind so you can't really see their faces. 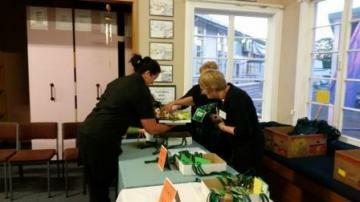 Whaea Lesa did not get permission to use their photographs in this story because there were so many ex-students and ex-teachers visiting! 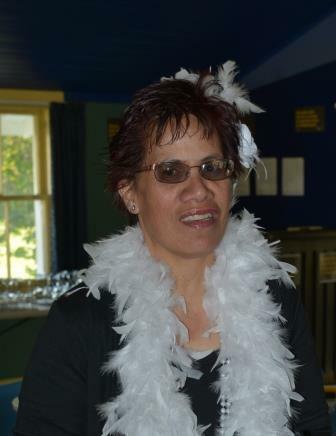 Whaea Jeanette was in 'fancy dress' for the night! Whaea Jeanette and Mr Haimona were just doing some 'last minute' checks on the ICT equipment. 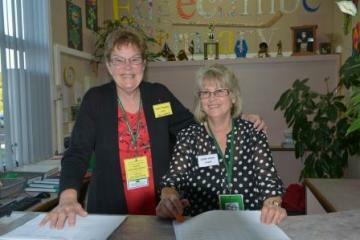 Mrs Mitchell (Reading Recovery specialist), Mrs Davey (Past Junior syndicate Senior Teacher), Mrs Parekowhai (Past teacher and Present reliever) and Mrs Johnston (Junior syndicate Senior Teacher and is also retiring at the end of 2014) - part of our Registration Team. Mrs Thompson (present Office and Jubilee Secretary) and Mrs Heyes (Office Accounts) - ready to Meet and Greet before sending visitors to the Registration Team waiting in the staff room. The Registration Team swing into action! 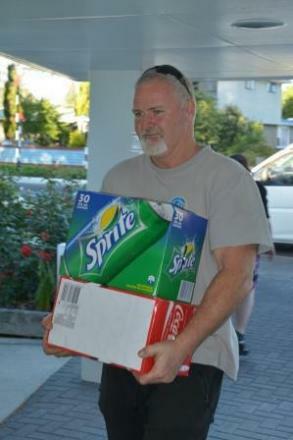 Mr Lees (Parent helper and Whaea Lesa's partner) helping the catering staff bring in liquid refreshments and their gears. 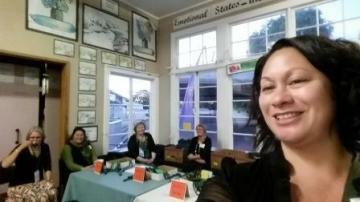 Whaea Joelle was helping too. Here is Mr Flynn, Matua Brett, Mr Haimona and Mr Lees waiting for some more jobs to come their way. Mr Flynn organized the fire pit and burning material for the bon fire. 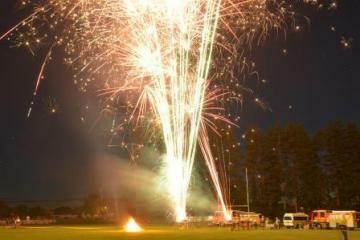 During the night, the visitors got to meet the official Jubilee Committee. 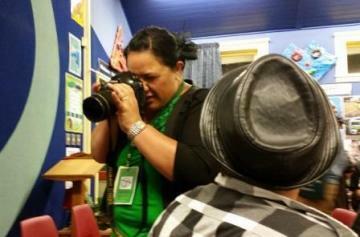 During the night, Whaea Joelle became the photographer! Steve (wearing the black hat) was our real one and had a little rest - actually, Whaea Joelle was having a lot of fun taking everyone's photographs and listening to so many neat stories, she found it hard to give the camera back! Here is the Flynn family! 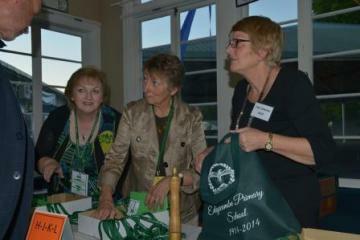 This family has a very strong bond to Edgecumbe Primary School. Mr Flynn and Mrs Flynn used to work at EPS, Kelly (on the left) and Mrs Reid used to come to school here and they are part of the Jubilee Committee. Mrs Reid has children coming to EPS and also works at our school as a relieving teacher. Here is the Roebuck family again! Their grandchildren come to EPS. They support school trips and events. Here are Mr Emms, Mrs and Mr Davey with their daugher Mrs Davey-Emms and granddaugher, Miss Davey-Emms. 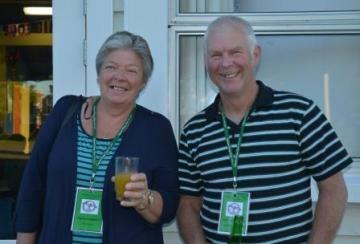 Mr Davey and Mrs Davey are part of the Jubilee Committee and once worked at EPS. Mr Davey was the Principal and Mrs Davey was the Junior syndicate Senior Teacher. Mrs Davey-Emms once worked at EPS but now works at the local Kindergarten. Mr Emms helps on school trips and events when he can and he also coaches a local soccer team. 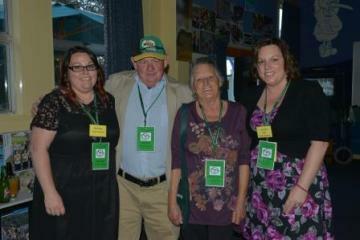 Mr Emms and Mrs Davey-Emms were featured in our 'Local Heroes' part of our 'Discovering Edgecumbe' story in 2013. Another supportive and helpful family to our EPS community. 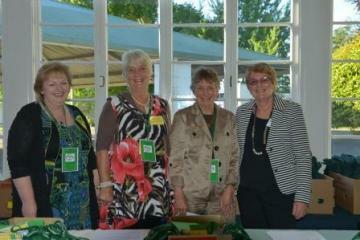 Whaea Lesa with some of the Registration Team, who are still waiting for visitors to arrive. Mrs Clark and Whaea Carol have joined the team too. Here is one of the catering staff bringing some refreshments to our Registration Team...who are still waiting for visitors! 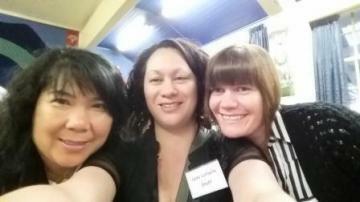 Here is Mrs Carter, Whaea Lesa and Whaea Niki having a fun moment. 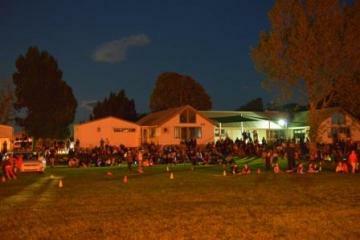 The disco was held at the church hall just across the road from our school. The Blue Light organisation ran and monitored the disco. What an awesome group of people and a huge 'Thank You' to the parents and teachers who went along to help. 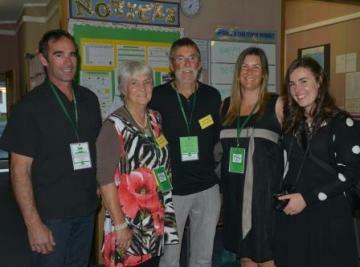 Whaea Sarah, Matua Brett were just two teachers at the disco and many of our well known parents were also helping too. This is what they were treated to! What an amazing night! Past and present staff and ex-students had a wonderful end to a long day. 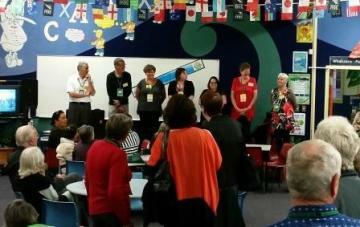 Whaea Lesa thought the most amazing part of the 'Mix and Mingle Night' was watching people meet each other after many, many years!